Giving yourself permission to rest. As of January 13th, this little blog has turned the ripe old age of 1! I can hardly believe how far I’ve come with this journey. I fondly remember the day I listened to my guides and finally (after 2 months of this floating around in my mind) I got on WordPress and started typing. As soon as I hit the send button I thought, “oh boy, Nicole, you’ve done it. Not only are you crazy, but now everyone knows you’re crazy!” My heart was racing. I’m glad to say that things have worked out pretty well so far with this endeavor. When Spirit told me I’d be a teacher I thought, “how am I going to teach this stuff? I barely know what I’m doing here!” They asked me to trust them, and the process. Things have unfolded beautifully- as they always do when I trust my guidance. It’s my conscious thinking that gets me into trouble, never my guidance. Having said that, I’d like to share with you a couple of cards that I recently pulled for myself. I sometimes use the cards when I’m too stressed out to relax. They help me to focus on something visual, and then I’m able to simmer down. Ironically, from two different decks, I got the same message. 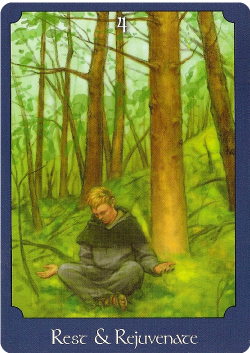 "Rest & Rejuvination" from the Psychic Tarot by John Holland. It would seem that not giving myself the opportunity to rest has given rise to the tension and worry that I’m not going to finish the race, so to speak. I’ve not taken time to meditate much lately, at least not like I used to. The call of my blog, my facebook page, my radio show, my articles on Examiner.com and my actual full time job have been constant, distracting thoughts. I’ve gotten to the point where I can’t actually write anything because my mind is in too many places at once. So for the past week, I’ve been doing as close to nothing as possible. It’s not easy for me to do that. I can barely sit through a movie, let alone do nothing at all! I’ve not seen the entirety of 3 out of the last 4 movies I’ve tried to sit down with. 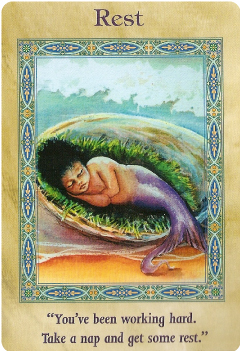 "Rest" from Doreen Virtue's Magical Mermaids & Dolphins oracle deck. I carry that lesson with me wherever I go, and yet for some reason while working for myself it seems to be elusive. It’s easier for me to leave work than it is for me to mentally leave work when it’s right on my lap, here at my home. A while back when I asked Spirit to help me with my work situation, which has been quite difficult for the last few years, I pulled the “Self-Employment” card from Doreen Virtue’s Magical Mermaids & Dolphins deck. I have no idea why this deck works so well for me, and truth be told I resisted buying it, but my guides insisted, and it felt right to me even though the concept really isn’t ‘me.’ It’s one of her older decks. I had never pulled that card before, and because I had just started working as a independent contractor, I knew it was probably prophetic. Where things will lead, I have no idea. But in times like these I remember a book that I read called, “Sink Reflections,” by Marla Cilley, affectionately known as the FLYlady (Finally Loving Yourself). If you’re suffering from being disorganized and need to get your head on straight to set some goals for the upcoming year, I highly recommend it. ~ by healingstarspirit on January 19, 2011.